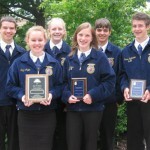 At this year’s FFA Activities Week held at Penn State University, June 14 – 16, 24 Manor FFA members competed in several Career Development Events where students involved in high school agriculture education programs can further research and practice skills that are learned in the classroom. They then use that information to determine if that is a career area that they would like to pursue. 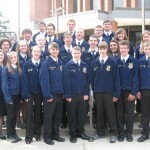 The CDE’s that the chapter members participated in were; Extemporaneous Public Speaking, Poultry Evaluation and Technology, Meats Evaluation and Technology, Wildlife, Agronomy, Dairy Foods Technology, and Small Animal/Vet Science. Kaleb Long earned a Gold Award in Extemporaneous Public Speaking and was also recognized with a State Proficiency Award in Swine Production. 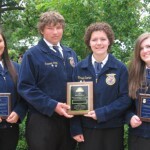 The Manor scrapbook of FFA activities completed by Margaret Drumm and the scrapbook committee also earned a Gold Award. Meats Evaluation and Technology Team earned first place and a trip to compete in the National FFA Convention in Indianapolis, Indiana in October. The Agronomy team placed 2nd and will represent Pennsylvania at the Big E, Eastern States Exposition in Springfield, Mass in September. Manor FFA completed the Chapter Evaluation Award application that includes FFA activities on the National FFA, State FFA and local FFA levels. This application is completed by a committee of students and is evaluated by a team of Agriculture teachers and Penn State University Personnel. 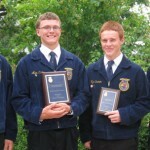 Manor FFA earned a Gold Award in this category and the application will be submitted for review at the national level.